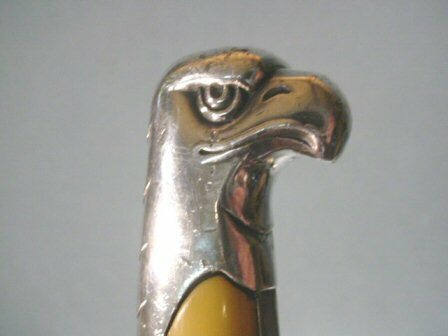 DESCRIPTION: This is a nice example of the RAD hewer. It is in the average condition that they are found in. 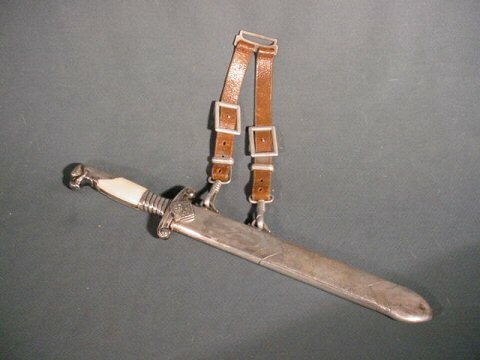 Always remember besides being an item of dress these also served as tools. 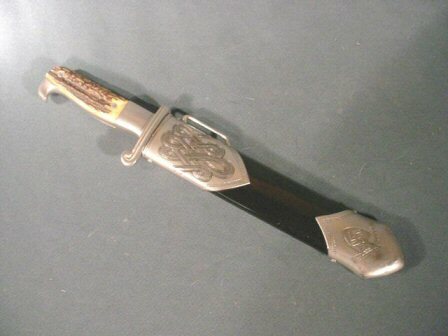 For instance, the back of the hilt at the top invariably has marks in the plating like dozens of little dings. Why? Well, notices of work details and R&R exercises were posted daily. 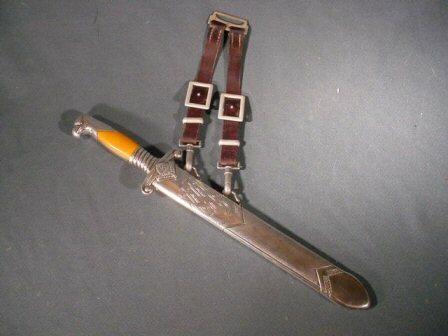 What could be more handy than that dagger to tack it up with? 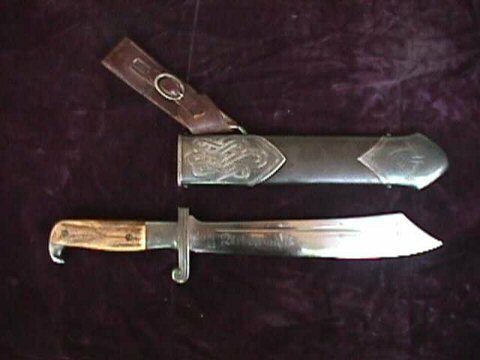 The blades like this one are 90 percent of the time in sharpened or worn condition. This one qualifies for both. 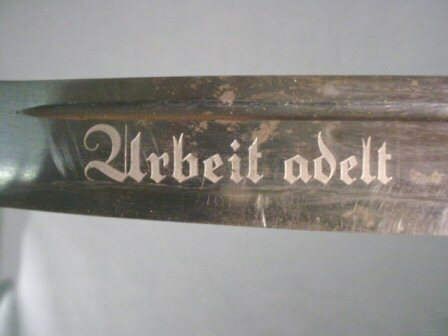 Also, the Arbeit Adelt, 'Work Glorifies,' motto is worn at the bottom of the letters because of the sharpening and cutting? 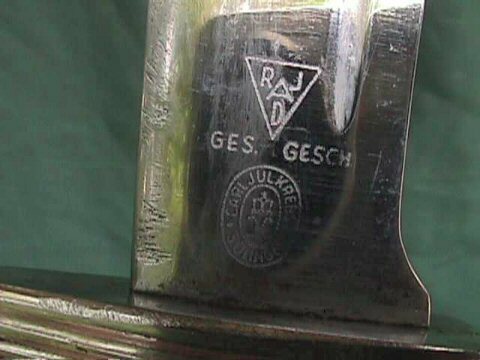 The blade is from Carl Julius Krebs Solingen who, having the original RAD contract, made the best of the hewers. 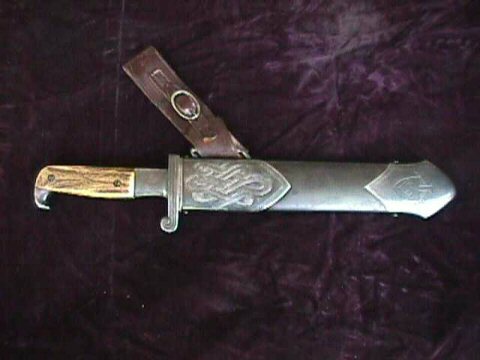 The scabbard is in the usual heavily used shape overall. Seems to be original paint, but with scratches and gouges in the paint, but no dings or abrasions. 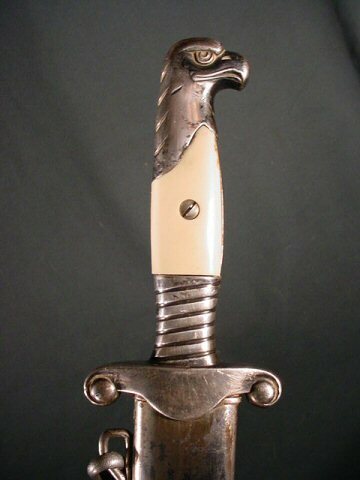 All in all, this dagger is not bad at all. It is a good, honest example of this the RAD ("Giant Killer"!) You won't find better for the money. DESCRIPTION: Here is one of the best-condition Hewers we have ever encountered. There is some slight surface rusting that will easily clean up. 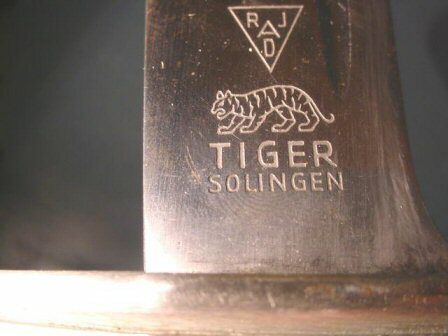 This is by ‘Tiger’ Solingen--considered a rare maker. 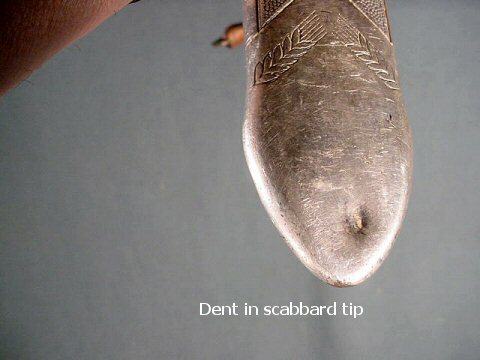 The metal fittings of the grip are like new and although most of these found are scarred on the grip’s tang finial from tacking up RAD notices, this one escaped this usual defacing. 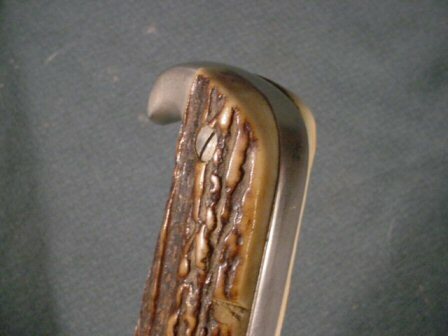 The stag grips are in great shape, as well. 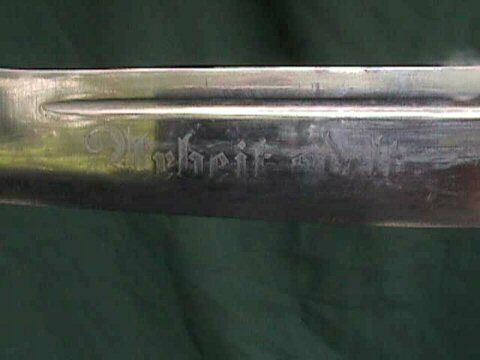 Many of these enlisted-rank Hewers have repainted scabbards, but this one is with original unscathed condition (shiny black). Here is the ultimate example of the RAD Hewer. 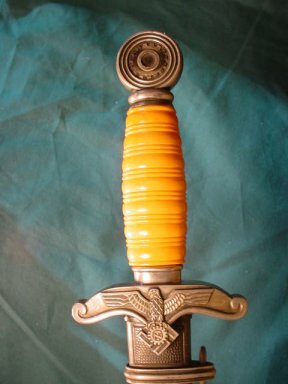 DESCRIPTION: Here is the most desirable and sought after of the RAD daggers (the deep-orange-grip model). This is a fine example of the finest of these the most beautiful of N.S. 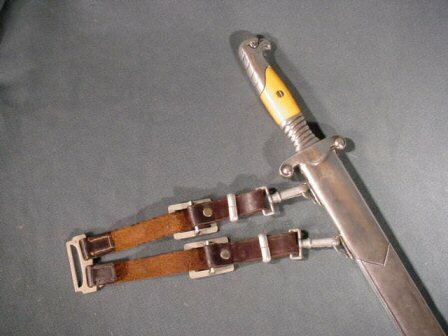 edged weapons. 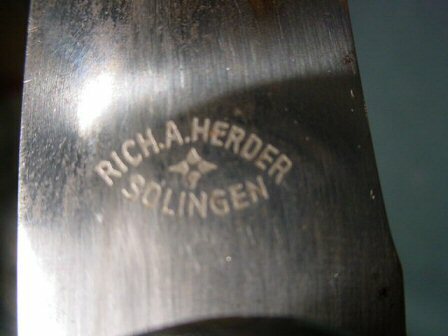 The blade is marked Rich A. Herder Solingen and is in beautiful condition. 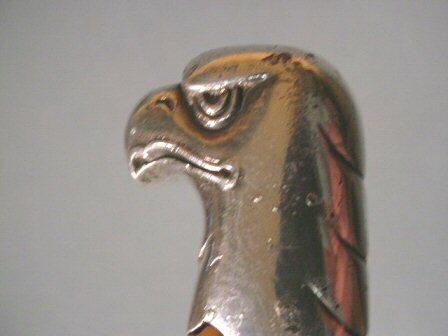 The grip’s metal parts are bright with the slightest pitting in the plating; usual with these pieces. 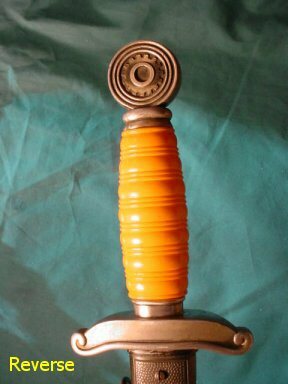 The grip on the front side is deep orange while the backside is an orange-to-yellow color. Undoubtedly, this is from wear against the tunic of the wearer. The hanger’s in great condition, as well. 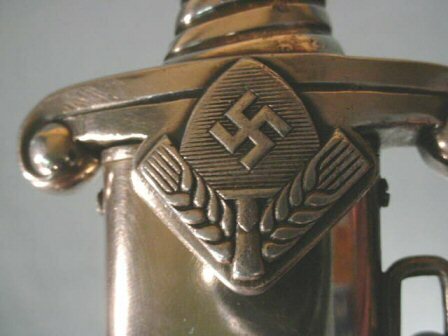 All around, this is a superior dagger of the Reich. 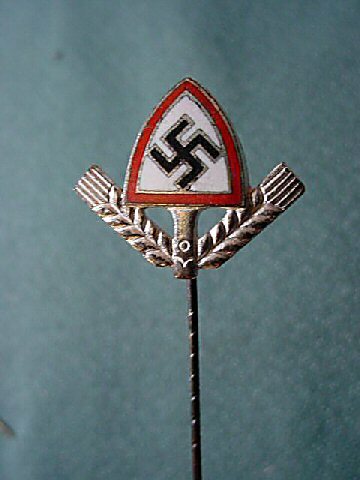 DESCRIPTION: This is a non-enameled stickpin for the Reichs Arbeit Dienste with "Ges Gesch" on the back. Good condition. Painted surface. 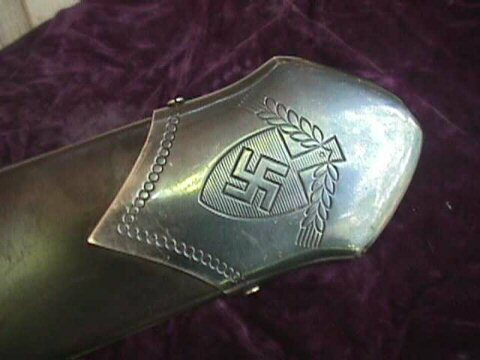 DESCRIPTION: This is one of the rare daggers of the Third Reich. 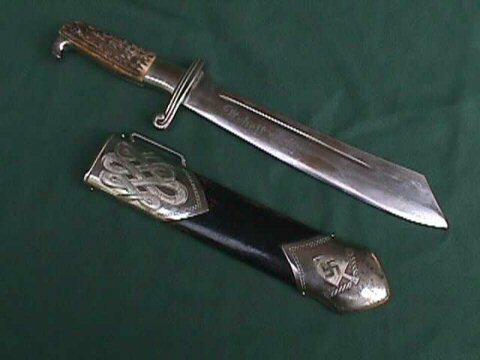 This was often called the Teno senior dagger. Seldom does one show up in the immaculate condition of this one. 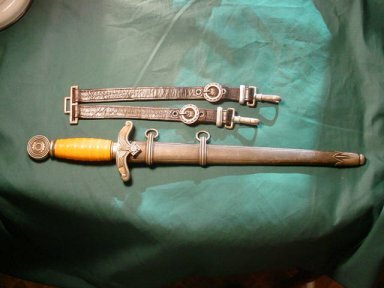 It also has the almost never found leather hangers with it, all the darkening application that is added at the factory is intact, and the blade is perfect, also. 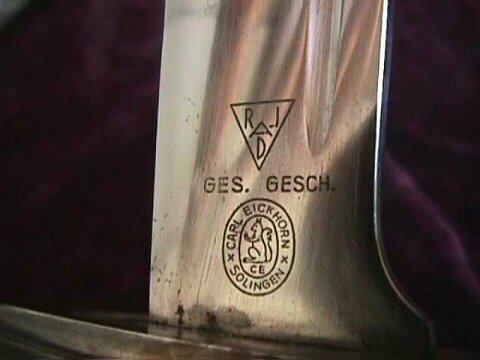 This dagger is from the Technical Emergency Corps (Technische Nothilfe). 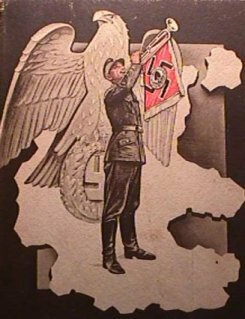 This organization was formed in 1919 after WWI. 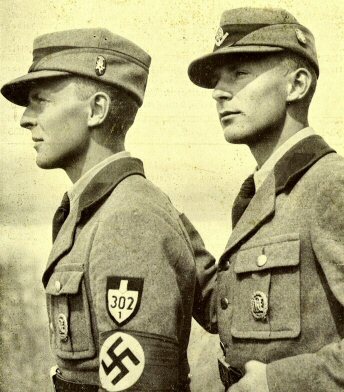 It was organized to assist the population during times of crisis or disaster under the National Socialist government. 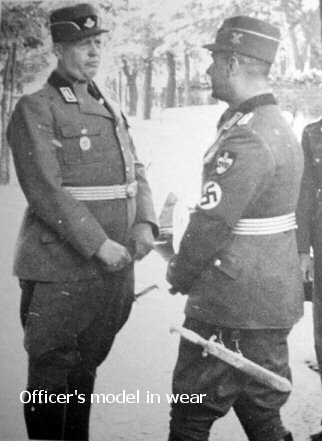 It reorganized the TN as one of the main party formations and the direct control was delegated to the director of the German Police, Heinrich Himmler. 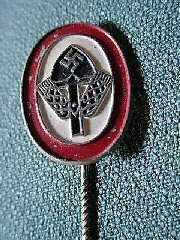 In effect, the TN developed into the Engineer Corps of the German Police Force. It was quite active in rescuing and aiding the local population during and after air raids, it assisted in the repair of damages to industrial plants as well as installations. 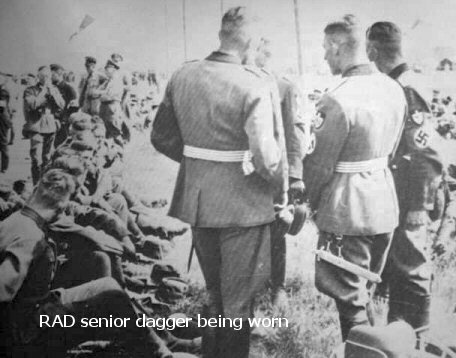 Later in the war field units were organized to operate with the German armed forces in rear areas as well as in occupied (liberated) countries. These TN units were used for demolition work, clearing waterways, and railway, and repairing damage to public utilities in isolated instances. Members of the TN were required to fight as front-line troops. 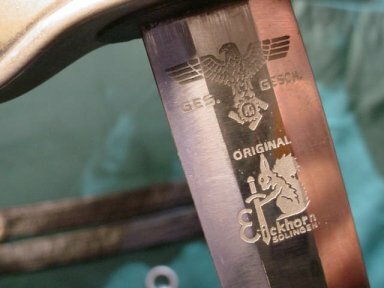 The dagger we present here is marked with the Eickhorn squirrel and it has the Teno eagle that is also etched above the squirrel. 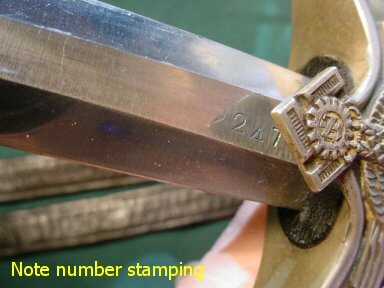 The blade is serial marked with 2247 both at the base of the blade and at the lip of the scabbard. 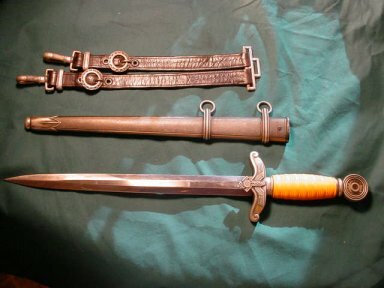 Because of the relatively small membership in the Teno, the daggers are considered rare!, particularly those of officers. 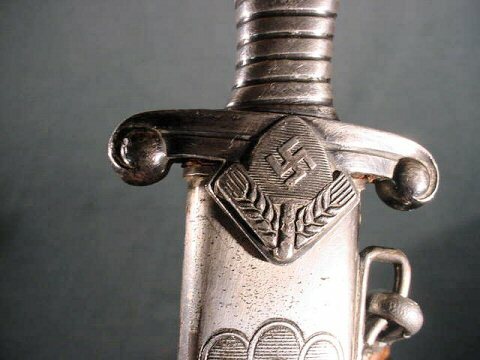 The officer's dagger was designed solely for ornamental wear and was worn by all officers in the grade of Stabssharführer and above. This is about the finest one we have seen in many years and to find hangers with it is almost unheard of. Don't miss this one! 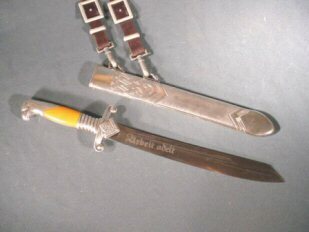 DESCRIPTION: This is a very nice example of this rare dagger by Carl Julius Krebs Solingen. 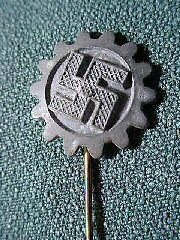 Krebs was the company with the original Labor Corps contract and they made the best of them. 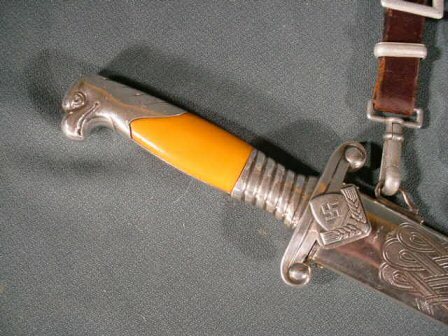 The dagger is in excellent condition, but has the little nicks and tiny scratches that usually appear on these models. 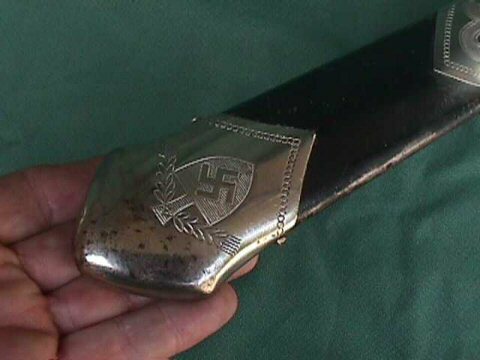 Unlike some of the once-a-month-worn daggers of the Third Reich, these were worn on an every-day basis. 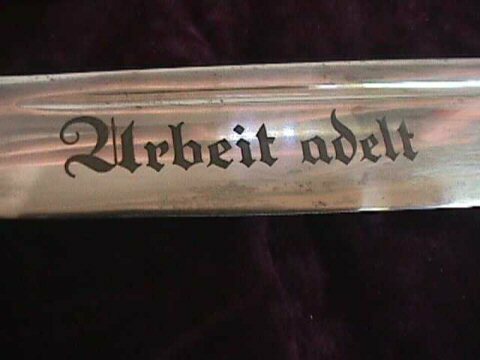 The motto Arbeit Adelt (Work Glorifies) is clear with all its anodized finish. The grips are perfect-a little staining on the blade (hardly noticeable). 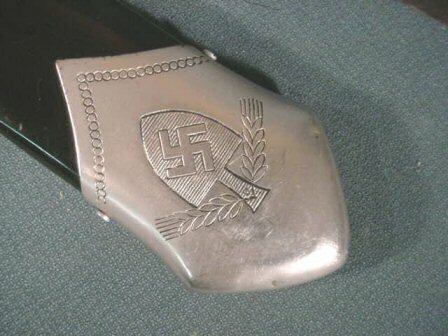 There is some oxidation on the grip medal, but no more than usual. 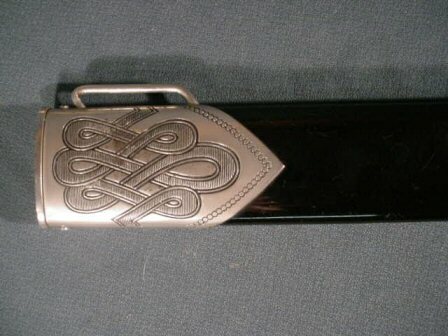 The scabbard is very good with a little finish loss at the top where it usually rubbed against the uniform. Again, this does not really detract. 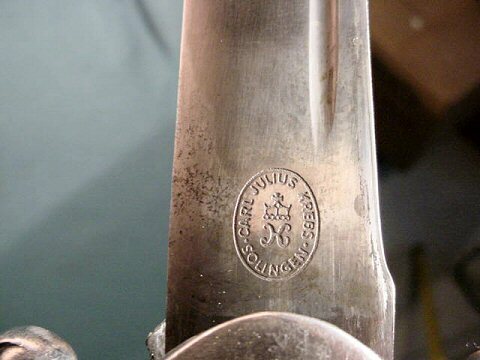 The only really noticeable negative is a dent at the tip of the scabbard. 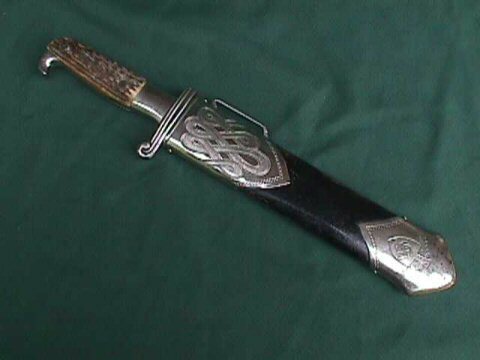 This was expected and appears on many examples of this particular officer's dress dagger. 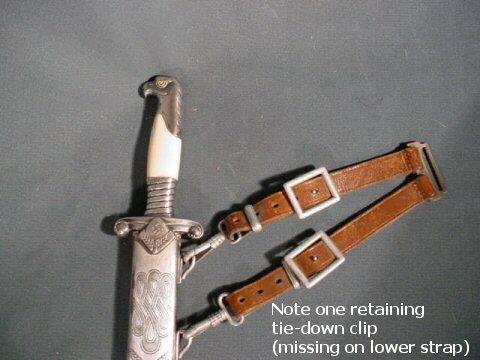 The dagger is accompanied with the rare leather hangers that are in equally fine condition. This item is very fine and rare!